Product information "CBX2 chromodomain (human recombinant)"
CBX2 is a component of the polycomb repressive complex 1 and represses protein expression. The chromodomain regions of CBX2 recognizes histone H3 trimethyl lysine 9 (H3K9me3) or trimethyl lysine 27 (H3K27me3). CBX2 knock-out mice have impaired spleen formation, T cell expansion, and inactivation of the X chromosome, which can be lethal in some cases. 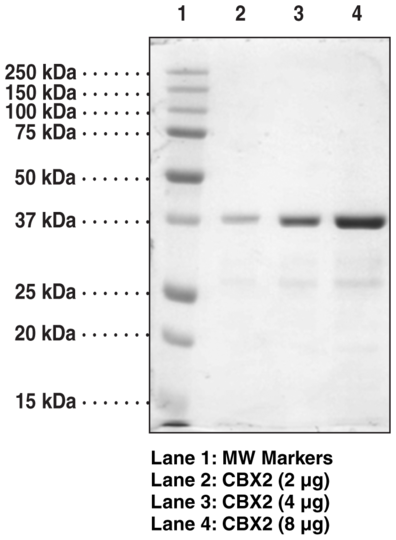 This protein product contains the chromodomain region of CBX2. Customer review for "CBX2 chromodomain (human recombinant)"